Simpler defensive walls of earth or stone, thrown up around hillforts, ringworks, early castles and the like, tend to be referred to as ramparts. 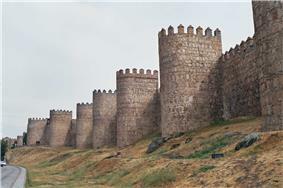 From very early history to modern times, walls have been a near necessity for every city. 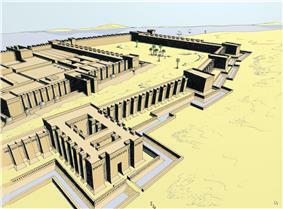 Uruk in ancient Sumer (Mesopotamia) is one of the world's oldest known walled cities. Before that, the city (or rather proto-city) of Jericho in what is now the West Bank had a wall surrounding it as early as the 8th millennium BC. Some settlements in the Indus Valley Civilization were also fortified. By about 3500 B.C., hundreds of small farming villages dotted the Indus floodplain. Many of these settlements had fortifications and planned streets. The stone and mud brick houses of Kot Diji were clustered behind massive stone flood dykes and defensive walls, for neighboring communities quarreled constantly about the control of prime agricultural land. Mundigak (c. 2500 B.C.) in present-day south-east Afghanistan has defensive walls and square bastions of sun dried bricks. Exceptions were few — notably, ancient Sparta and ancient Rome did not have walls for a long time, choosing to rely on their militaries for defense instead. Initially, these fortifications were simple constructions of wood and earth, which were later replaced by mixed constructions of stones piled on top of each other without mortar. Large tempered earth (i.e. rammed earth) walls were built in ancient China since the Shang Dynasty (c. 1600-1050 BC), as the capital at ancient Ao had enormous walls built in this fashion (see siege for more info). Although stone walls were built in China during the Warring States (481-221 BC), mass conversion to stone architecture did not begin in earnest until the Tang Dynasty (618-907 AD). In terms of China's longest and most impressive fortification, the Great Wall sections had been built prior to the Qin Dynasty (221-207 BC) and subsequently connected and fortified during the Qin dynasty, although its present form was mostly an engineering feat and remodeling of the Ming Dynasty (1368–1644 AD) during the 15th and 16th centuries. The large walls of Pingyao serve as one example. Likewise, the famous walls of the Forbidden City in Beijing were established in the early 15th century by the Yongle Emperor. 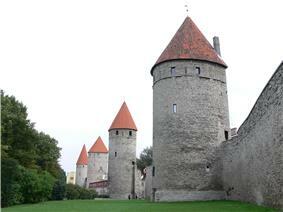 Apart from these, the early Middle Ages also saw the creation of some towns built around castles. These cities were only rarely protected by simple stone walls and more usually by a combination of both walls and ditches. From the 12th century AD hundreds of settlements of all sizes were founded all across Europe, who very often obtained the right of fortification soon afterwards. The founding of urban centers was an important means of territorial expansion and many cities, especially in central and eastern Europe, were founded precisely for this purpose during the period of Eastern settlement. 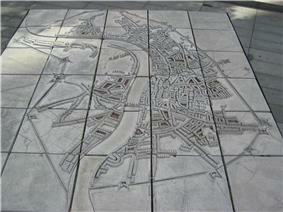 These cities are easy to recognise due to their regular layout and large market spaces. 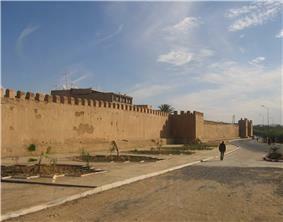 The fortifications of these settlements were continuously improved to reflect the current level of military development. During the Renaissance era, the Venetians raised great walls around cities threatened by the Ottoman Empire. Among the finest examples are the walled cities of Nicosia and Famagusta in Cyprus and the fortifications of Candia and Chania in Crete, which still stand to this day. 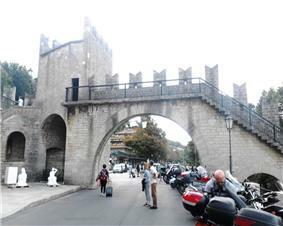 A city gate with its towers, the defensive walls, and the city ditch from the 13th century in Metz, France. 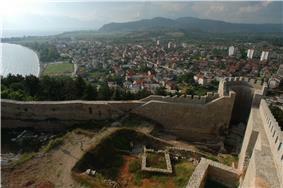 The medieval fortress overlooking the city of Ohrid in the Republic of Macedonia. 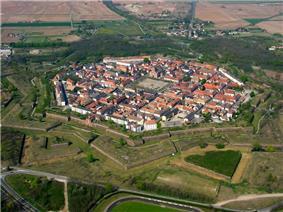 Aerial view of Neuf-Brisach (Alsace) with walls and fortifications built by Vauban after 1697. 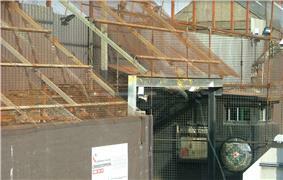 At its most simple, a defensive wall consists of a wall enclosure and its gates. For the most part, the top of the walls were accessible, with the outside of the walls having tall parapets with embrasures or merlons. North of the Alps, this passageway at the top of the walls occasionally had a roof. Pre-wall: wall built outside the wall proper, usually of lesser height — the space in between was usually further subdivided by additional walls. Urban areas outside the city walls, so-called Vorstädte, were often enclosed by their own set of walls and integrated into the defense of the city. These areas were often inhabited by the poorer population and held the "noxious trades". In many cities, a new wall was built once the city had grown outside of the old wall. This can often still be seen in the layout of the city, for example in Nördlingen, and sometimes even a few of the old gate towers are preserved, such as the white tower in Nuremberg. Additional constructions prevented the circumvention of the city, through which many important trade routes passed, thus ensuring that tolls were paid when the caravans passed through the city gates, and that the local market was visited by the trade caravans. Furthermore, additional signaling and observation towers were frequently built outside the city, and were sometimes fortified in a castle-like fashion. The border of the area of influence of the city was often partially or fully defended by elaborate ditches, walls and/or hedges. 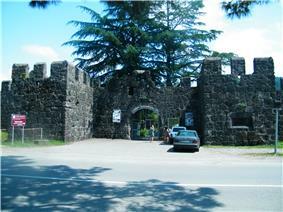 The crossing points were usually guarded by gates or gate houses. These defenses were regularly checked by riders, who often also served as the gate keepers. Long stretches of these defenses can still be seen to this day, and even some gates are still intact. 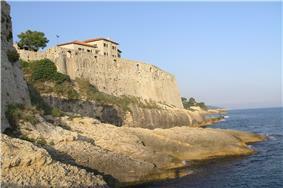 To further protect their territory, rich cities also established castles in their area of influence. A famous example of this practice is the Romanian "Dracula Castle" at Bran/Törzburg, which was intended to protect Kronstadt (today's Braşov). The city walls were often connected to the fortifications of hill castles via additional walls . 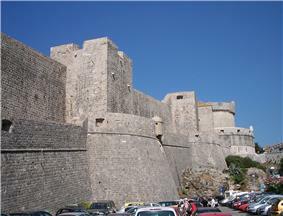 Thus the defenses were made up of city and castle fortifications taken together. Several examples of this are preserved, for example in Germany Hirschhorn on the Neckar, Königsberg and Pappenheim, Franken, Burghausen in Oberbayern and many more. A few castles were more directly incorporated into the defensive strategy of the city (e.g. Nuremberg, Zons, Carcassonne), or the cities were directly outside the castle as a sort of "pre-castle" (Coucy-le-Chateau, Conwy and others). Larger cities often had multiple stewards — for example Augsburg was divided into a Reichstadt and a bishopal (clerical) city. 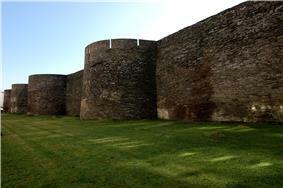 These different parts were often separated by their own fortifications. With the development of firearms came the necessity to expand the existing installation, which occurred in multiples stages. Firstly, additional, half-circular towers were added in the interstices between the walls and pre-walls (s.a.) in which a handful of cannons could be placed. 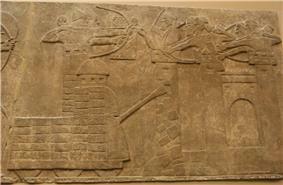 Soon after, reinforcing structures — or "bastions" — were added in strategically relevant positions, e.g. at the gates or corners. A well-preserved example of this is the Spitalbastei in Rothenburg or the bastions built as part of the 17th-century walls surrounding Derry, a city in Northern Ireland; however, at this stage the cities were still only protected by relatively thin walls which could offer little resistance to the cannons of the time. Therefore, new, star forts with numerous cannons and thick earth walls reinforced by stone were built. These could resist cannon fire for prolonged periods of time. 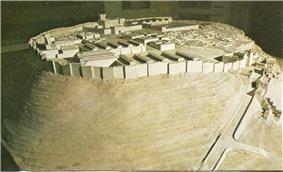 However, these massive fortifications severely limited the growth of the cities, as it was much more difficult to move them as compared to the simple walls previously employed — to make matters worse, it was forbidden to build "outside the city gates" for strategic reasons and the cities became more and more densely populated as a result. 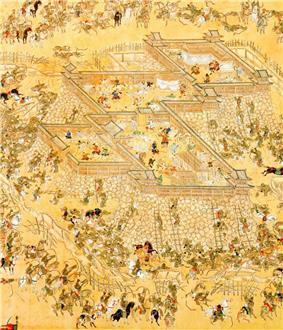 In the wake of city growth and the ensuing change of defensive strategy, focusing more on the defense of forts around cities, most city walls were demolished. Also, the invention of gunpowder rendered walls less effective, as siege cannons could then be used to blast through walls, allowing armies to simply march through. Today, the presence of former city fortifications can often only be deduced from the presence of ditches, ring roads or parks. Furthermore, some street names hint at the presence of fortifications in times past, for example when words such as "wall" or "glacis" occur. In the 19th century, less emphasis was placed on preserving the fortifications for the sake of their architectural or historical value — on the one hand, complete fortifications were restored (Carcassonne), on the other hand many structures were demolished in an effort to modernize the cities. A notable exception in this is the "monument preservation" law by the Bavarian King Ludwig I of Bavaria, which led to the nearly complete preservation of many impressive monuments such as the Rothenburg ob der Tauber, Nördlingen and Dinkelsbühl. The countless small fortified towns in the Franconia region were also preserved as a consequence of this edict. Berlin's city wall from the 1730s to the 1860s was partially made of wood. Its primary purpose was to enable the city to impose tolls on goods and, secondarily, also served to prevent the desertion of soldiers from the garrison in Berlin. The Berlin Wall did not exclusively serve the purpose of protection of an enclosed settlement. One of its purposes was to prevent the crossing of the Berlin border between the GDR and the West German exclave of west-Berlin. Defensive walls have been built in Korea along the De-militarised Zone. Additionally, in some countries, different embassies may be grouped together in a single "embassy district," enclosed by a fortified complex with walls and towers — this usually occurs in regions where the embassies run a high risk of being target of attacks. An early example of such a compound was the Legation Quarter in Beijing in the late 19th and early 20th centuries. Most of these "modern" city walls are made of steel and concrete. Vertical concrete plates are put together so as to allow the least space in between them, and are rooted firmly in the ground. 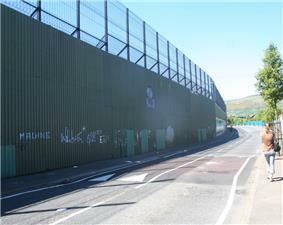 The top of the wall is often protruding and beset with barbed wire in order to make climbing them more difficult. 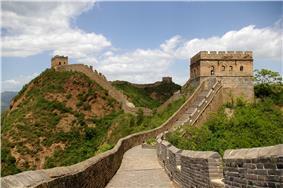 These walls are usually built in straight lines and covered by watchtowers at the corners. Double walls, i.e. two walls with an interstitial "zone of fire" (cf. 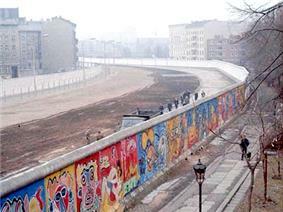 the Berlin wall) are rare. In September 2014, Ukraine has announce construction of "European Rampart" alongside its border with Russia to be able to successfully apply for a visa-free movement with the European Union.